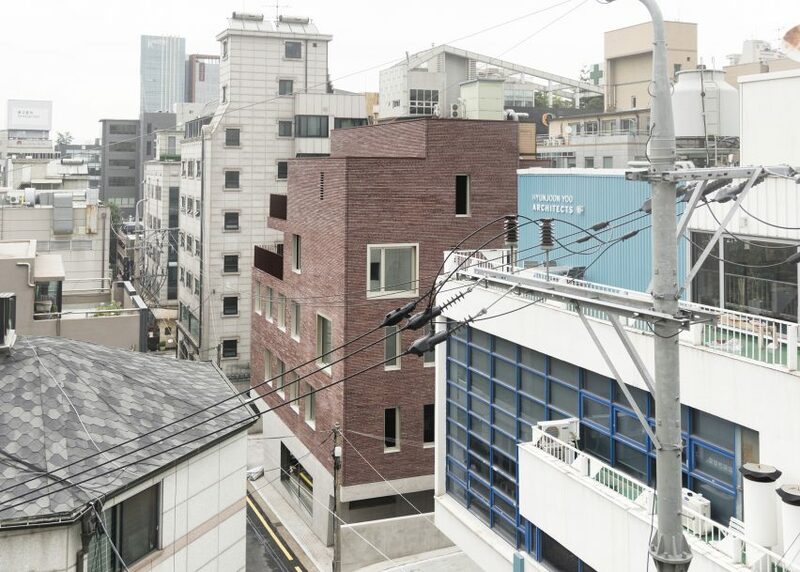 Four floors clad in slim red bricks sit above the concrete base of this office and apartment block in the South Korean city Seoul, which was designed by local firm Stocker Lee Architetti. 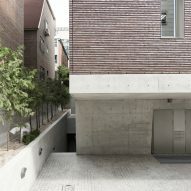 The Nonhyun 101-1 building is located in the Gangnam district, a commercial area in the south of Seoul. 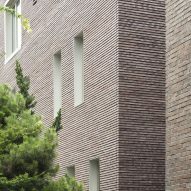 Stocker Lee Architetti chose red brickwork as the primary material to help the mixed-use building to stand out in its densely built location. 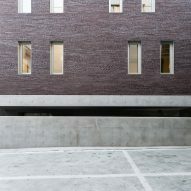 The long and thin bricks cover the upper four floors, which are equally into flats and office space. 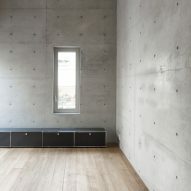 The ground floor is made of reinforced concrete and is slightly smaller than the floors above. 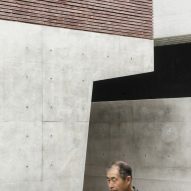 This top-heavy construction creates a large angled overhang, which covered the entrance to a cafe. 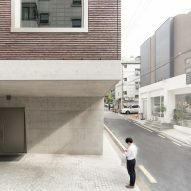 "Selected materials remark the strong contrast with the context and recreate a new order in this high-density area of the city," said Stocker Lee Architetti. 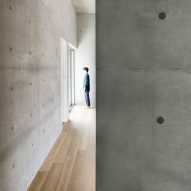 "A concrete basement, shaped by the structure, generates a filter space between inside and outside, public and private," added the studio. "It identifies the main entrance and the ground floor cafe and it also structurally supports a clear block of bricks on top." A pair of apartments are placed in the top two levels. These floors are stepped back to create terraces surrounded by balustrades, which are made up of vertical metal pieces coloured the same dark red as the brickwork. Each of the flats are arranged differently. 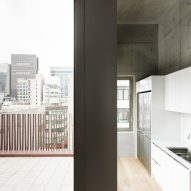 Both have open-plan kitchen, dining and living areas, but one features two bedrooms and bathrooms, while the other has just one of each. 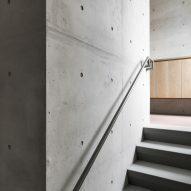 The inside of the building is finished minimally with reinforced concrete walls left mainly exposed throughout. Just a few are plastered and painted white. 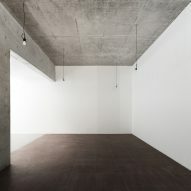 A mixture of burgundy and grey tile floors are used in the offices, while wooden floorboards cover the apartments. 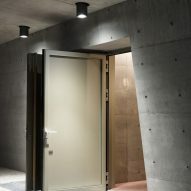 Each apartment also features white kitchen cabinets and bathrooms lined with muted green tiles. 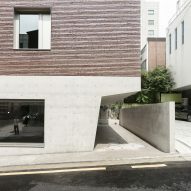 Nonhyun 101-1 joins new office blocks by Wise Architecture and ThePlus Architects in the city. 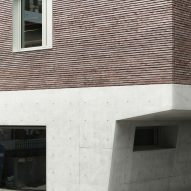 Wise Architecture also used brickwork for the design of its ABC office block, while ThePlus Architects created a faceted white building for a book publisher.